Very High Protection Cream SPF 50 offers 100% mineral sunscreen protection for skin that is extremely sun-sensitive. Titanium dioxide and zinc oxide provide non-irritating sun protection. Pre-tocopheryl provides powerful antioxidant protection. 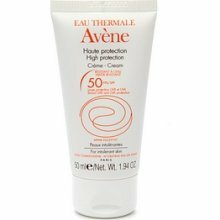 Avene thermal spring water soothes and softens. Highly water-resistant. Ideal for use on children. Hypoallergenic and noncomedogenic.